In May last year, president Koroma and his political allies in the ruling APC caused a national stir, when they instigated and touted their presidential third term agenda. But this attempt to blatantly tear up the country’s constitution as they have done in the recent past and introduce presidential continuity by stealth, was widely and roundly opposed and condemned. The debate was thought then to have died a death following the strong condemnation, especially by the country’s main opposition SLPP. More than twelve months on however, the ruling APC have resumed the third term agenda once again. Only this time, they seem to have found a strange political bedfellow – Julius Maada Bio – himself a former presidential contender at the 2012 national elections, who failed miserably to unseat Koroma from State House. Bio is now appearing to be providing much needed oxygen that is fueling president Koroma’s renewed confidence in revisiting his third term agenda. But lest we forget, many would like to recall the former brigadier’s strongly worded letter that he wrote to president Koroma on the 6th of May, 2014, warning the president to back off from his third term ambition. “I need hardly remind you that, you will bear the greatest responsibility for any negative consequences that may emerge,” Bio (Photo) warned Koroma. Today, Brigadier Bio is quite happy to be acting as the Koroma government’s third lieutenant by embarking on a nationwide tour, delivering the president’s message of Ebola sensitisation to a nation that has way past the sensitisation stage, and has even begun preparing for the declaration of the end of Ebola next weekend. As many Sierra Leoneans begin to ponder the former Brigadier’s political agenda in forming an alliance with president Koroma, ahead of the opposition SLPP presidential election, it is worth reflecting upon the letter Bio wrote to Koroma last year. On January 27, 2014, I wrote you an open letter on the amendment of Section 79 (1) of the National Constitution of Sierra Leone 1991 in which your Government introduced entirely new qualifications for the position of Speaker of Parliament. I also dealt with the purported annulment by a spurious court decision of the election results, in favour of the SLPP candidates of constituencies 05 and 15. I especially emphasised that the country will be strengthened and its administration respected, only if its government leads by scrupulously respecting and upholding the tenets of the nation’s Constitution and the Rule of Law. There was general suspicion that your motive for these changes was to enhance your ambition for a third term in office, the realization of which is only possible, to start with, by installing and maintaining a pliant Legislature. You will also recall that just a few months after the 2012 Elections, Mr. Balogun Logus Koroma, the APC Campaign Coordinator for the 2012 Elections, was on radio and newspaper justifying a third term tenure for you. As was expected, the people immediately opposed that third term proposal by Mr. Koroma, which compelled your office to issue a disclaimer. Whilst the public was still contemplating what could have been his motive, he was immediately awarded a senior ministerial portfolio – Minister of Transport and Civil Aviation. Mr. President, very recently, you informed political leaders that this is your second and final term in office, and urged them to work together for the peace and development of our country. Subsequently, however, for reasons which have bemused the public, the Deputy Publicity Secretary of your Party, Robin Fallay, again re-started the debate for your Third Term tenure. This has been followed by a well-orchestrated ploy to manipulate our deprived youths once again to demonstrate in favour of this plan. And in an undated Press Release from State House on this issue, although you re-echoed a denial of interest in a third term, viz: “At the moment, there is no room for debate on the tenure of Office of the President as it is clearly entrenched in the provisions of the Constitution of Sierra Leone”, yet in a recent meeting at your Party Headquarters in Freetown, you endorsed the superfluous thinking that people are free to debate the issue. Obviously, Sir, that Press Release and your recent support for the debate cannot sit comfortably together anywhere. Mr. President, all recent indications clearly suggest that you are supporting this debate, and that you also intend to promote another manipulation of the constitutional process. I would therefore be remiss of me, if I fail to tell you that Sierra Leoneans, including members of your own Party, are stoutly opposed to an extension of your presidency or a third term. And I need hardly remind you that, you will bear the greatest responsibility for any negative consequences that may emerge. It is also obvious that the question of either an extension of your presidency or a third term, contrary to the Constitution, is a matter of national security, not merely a matter of party politics. May I also remind you Mr. President that the current debate for a third term or an extension of your tenure will undermine the peace and stability of our country, and our fledgling democracy. This is already evident by the ongoing radio discussions up and down the country, and the reported rift among “mask devils” (masquerades) that paraded the streets of Freetown on the 53rd Independence Anniversary, on April 27, 2014. In this context, it is also significant to recall the recent admonition given by the United States Secretary of State, John Kerry, to your Congolese counterpart, President Joseph Kabila that African presidents must respect their country’s Constitution and not run for a third term in office. I observe that civil society groups, including the Press, have also on several instances pointed out to you the dangers of pursing this ambition. I want to take this opportunity to call on other well-meaning groups, particularly the Sierra Leone Bar Association, to join in this campaign against a third term or an extension of the tenure of your presidency. Mr. President, rather than getting distracted by this third term ambition, there are far more important issues that should engage your attention at this material time. These include the deteriorating electricity situation in all the provincial cities, except Makeni; the poor road conditions in the country; the growing youth unemployment; the fight against corruption; the weakening of the Judiciary; the high incidence of disease; the limited access to safe drinking water; the poor educational and health standards; the limited access to adequate and nutritious food; the poor working conditions for our workforce; the growing land-grabbing propensity and the deprivation of the rural poor. I would also like to encourage you to emulate the Late President Ahmad Tejan Kabbah, who upheld the Constitution of the Republic, promoted democracy and left us a peaceful Sierra Leone. History will certainly not judge you kindly, if you allow your personal ambition to override the national interest. I want to take this opportunity to once again appeal to all democratically-minded Sierra Leoneans, to do everything under the law to challenge what is happening in the country. As Sierra Leoneans at home and abroad, we only have one country that we can truly call our home, and we have a duty to guarantee its peace and tranquility. Rtd. Brig. Julius Maada Bio. 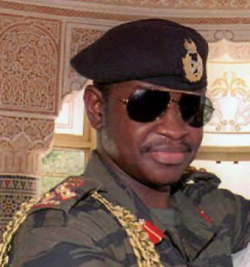 The question that Brigadier Maada Bio needs to answer now is, whether he regrets writing that letter to president Koroma last year? Early this year Maada Bio also accused the president of negligence and incompetence in managing the Ebola crisis. Bio has now changed his mind about that. He now believes that he was wrong in criticising Koroma. 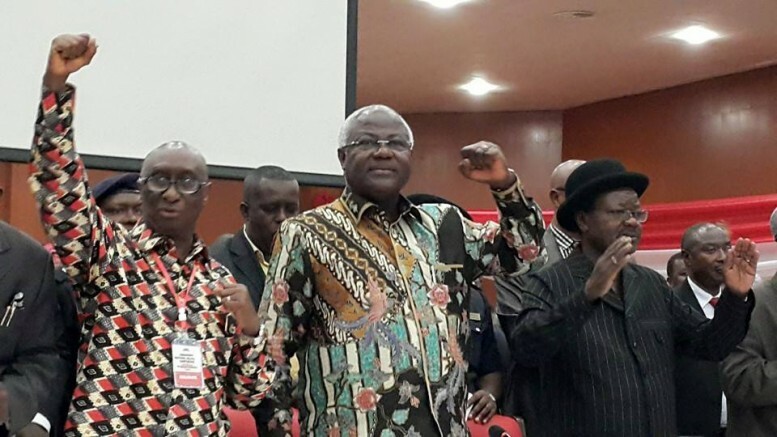 President Koroma he said, has done a great job in managing the Ebola crisis. Well, it seems two strangely odd political bedfellows have found each other. Is there anything else in Maada Bio’s skeletal cupboard that he has said or done in the past, which he now wishes to deny – or set the record straight? Will the true Maada Bio please stand and be counted? An edgy article with a Socratic bite! However the fine writer would have cleared much fog if he had interviewed both President Koroma and Brigadier Maada Bio to get their respective views on the issues in question. The reality is both Maada Bio and President Koroma are titans in the history of Sierra Leone politics. In the here and now, President Koroma is in the driving seat via the ballot box. Surely the late genial President Kabba lacked the ‘Kalabante’ or ‘adroit cunning’ bordering on mischief illegality. The APC cohorts are masters at this, hence when push came to shove, the SLPP caved in and the rest is history. See, power is a prized commodity and when once the APC clinched legitimate power, they are yet to surrender it via the ballot box. True too is that the APC has never staged a coup. Except if wooing the opposition for votes to change the constitution is disallowed. Wow but that would be illegal. So, a third term via the ballot box is preferable to a change a la Kalashnikov. Will the real Julius Maada Bio stand up and be counted? He has. He is an opportunist and like all opportunists, he cannot behave in a principled way. So it is not surprising to see him flip flopping from challenging the Koroma administration and now to supporting it. The reality of the matter is that this man is incapable of demonstrating a genuine commitment to a particular cause or idea. Political leadership is merely a means to an end and like most people in the SLPP, replacing the corrupt APC is simply an opportunity to get their hands on the kitty and not about bringing about any meaningful change. We should not expect much from a man who in the past twenty years has not been engaged in any meaningful endeavour in either the private or public sector. 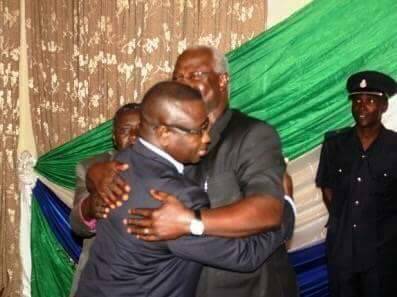 What is alarming, is that such an unprincipled person still commands support among a section of Sierra Leoneans. We hope that those who look to Bio to further a South Eastern / Mende hegemonic agenda, will begin to come to their senses and realise that the pursuit of that agenda is merely a con trick to keep a section of the electorate captive and that this agenda does not address the aspirations of poor and vulnerable Sierra Leoneans.